Chronic Hives, also referred to as urticaria, is an allergic reaction apparent on the skin as a rash. The rash may develop as lots of tiny little bumps which may look something like nettle rash, or they may appear as odd coloured and shaped swellings. These swellings are called Urticarial wheels. Large patches are often a symptom of chronic urticaria, these patches or wheels often grow and expand to join each other, sometimes covering the whole body. 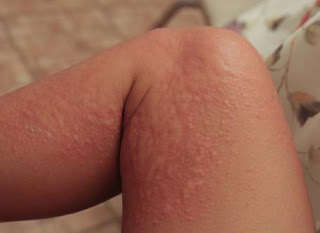 Hives or urticaria normally appear after contact with a triggering allergen which could range from cosmetics, airborne toxins, chemicals, drugs even food. Trying to find one's specific trigger is difficult at best & can be almost impossible, this is why most cases of chronic hives are referred to as idiopathic which basically means there is no known cause for the urticaria outbreaks. Although hives can occur on most parts of the body they rarely affect the palms of the hand or the soles of the feet. Hives (urticaria) is a condition classified as either acute or chronic depending on how often the outbreaks occur, cases which clear up within a period of six weeks or less are labelled as acute longer or repeated outbreaks are referred to as chronic. Unfortunately for many sufferers chronic hives can be a life changing affliction, although more often than not considered by many as nothing more than an allergy. The traditional treatment of acute and chronic hives is limited and depends on the period and extent of the outbreaks. The most commonly used treatments for chronic hives are Non-sedating prescribed or over the counter antihistamines, orally taken steroids, steroid creams and less frequently (depending on where you live cortisone injections). While these methods may provide a quick fix for many sufferers with the acute variation of hives (urticaria) they are not a long term answer and offer little or no relief for the chronic sufferer. It should also be noted that with long term use many of these drugs may actually be contributing to the overall condition due to toxins being left in the body causing a toxic build up. 1. When nothing else works, fast yourself on mineral water (or filtered water). 3. Use Vitamin D3, Sunlight is great but we're not all blessed with good whether, normal Vitamin D is not sufficient you will need to use D3 preferably in powder form as opposed to capsule or tablet, the recommended amount set in the USA is around 400 IU (international units per day), the UK offers no IU guidance at the time of writing. I take 1000 IU per day which helps. Cats claw has been used for over 2000 years in the treatment of intestinal and immune problems. 7. Chewing a clove once a day can kill intestinal parasites and act as an anti-microbial agent against fungi and bacteria which in many cases may contribute towards chronic hives (chronic urticaria). 8. To relieve pain and swelling, apply a cold towel or cool pack to the affected area. 9. Natural Ginger has been used for as long back as anyone can remember for treating upset stomachs, however it is also especially good for immune disorders. 10. Stop Smoking, if you are a smoker and you suffer with chronic hives (urticaria) your smoking will hinder any of your efforts, annoying I know but unfortunately that's the way it is. I found hives allergies after i eat too much chocolate, but i love to eat chocolates but i cant control on my self. Is there in medication, please suggest me what would I do? I saw this on Pintrest - My husband has suffered for 4 years with this and was put on long term disability for them. Just wanted to say while I thank you for the input above, it would have been nice to understand why you gave them as suggestions? Like, why fast on mineral water? Why avoid transfastty acids? Why do you suggest to quit smoking (other than the obvious...)? Any additional input would be greatly appreciated.